Sweden-based folding carton converter Kartongbolaget has installed a seven-colour HP Indigo 30000 digital press with integrated TRESU iCoat 30000 coater, as part of its efforts to provide short-run and personalised packaging service for the customers. The digital line has been commissioned to provide better services for the customers in the industrial, food, confectionery and personal care sectors across northern Europe. Designed for single-pass printing and coating, the integrated digital printing and flexo coating line provides maximum speed of up to 4600 sheets per hour and handles substrates of maximum format 750mm x 550mm in paperboard and metallised boards between 250µm and 600µm thickness. The new system is said to compliment an existing offset workflow, which comprises of six-colour Heidelberg Speedmaster XL75, die-cutters and other finishing equipment. Kartongbolaget has installed the system to carry out short and personalized that can produce up to 5000 sheets and conduct sample production. The firm offers multiple additional services, including digital printing, versioning and variable data printing for limited editions. It will also help customers to trace supply chain, personalised products, interactive packaging connected to social media competitions and samples on-demand. It can also print on plastic substrates, and helps to accommodate PVC and polypropylene up to 630µm, and PET up to 400µm. Kartongbolaget managing director Joakim Johansson said: “We were determined to invest in HP Indigo’s liquid toner technology because of its proven performance and versatility. 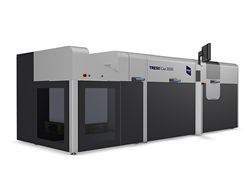 Image: Kartongbolaget has commissioned seven-colour HP Indigo 30000 digital press with integrated TRESU iCoat 30000 coater. Photo: courtesy of TRESU Group.